You would like to explore combinations without errors? We advice you the Happy Cube Solver Software. This software enables you to design your own constructions, and shows you the exact steps to create these sensational pieces of art. 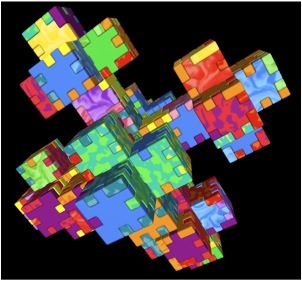 This interactive environment for building Happy Cube combinations is written by Shy Shalom. We grated authorization to him to create the software, under explicit reservation of our rights on the Happy Cube Puzzles. The software is released as OpenSource on sourceforge.net. 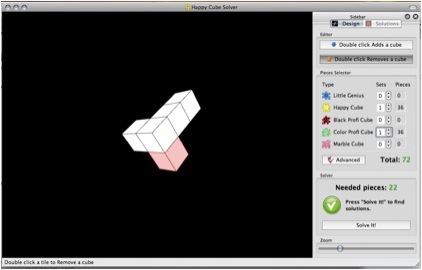 Download ‘the Happy Cube© solver’-software. Using this program automatically implies that you respect the copyrights on the Happy Cube©® Puzzles. Modification of this open source program and it's specific content is only admissible after consultation and authorization (contact info@happy.be).